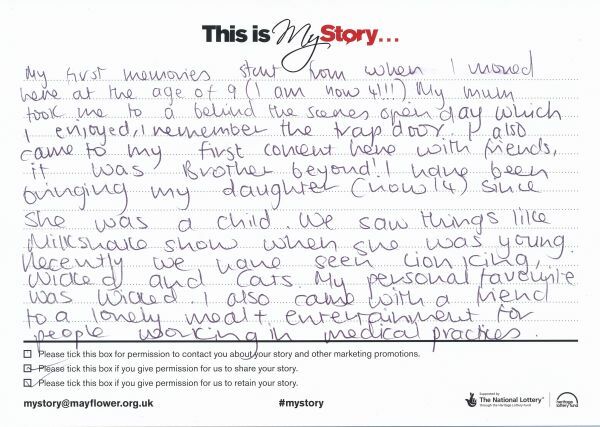 My Story card: Emma Nicholson remembers seeing many shows with her mother and, later, her daughter. My first memories start from when I moved here at the age of 9 (I am now 41!!) My mum took me to a behind the scenes open day which I enjoyed, I remember the trap door. I also came to my first concert here with friends, it was Brother Beyond! I have been bringing my daughter (now 14) since she was a child. We saw things like Milkshake show when she was young. Recently we have seen The Lion King, Wicked and Cats. My personal favourite was Wicked. I also came with a friend to a lovely meal and entertainment for people working in medical practices.